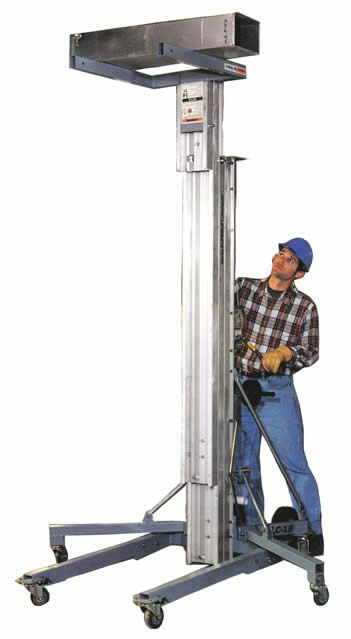 Genie or LiftSmart Construction pro style material lifts with max lift height of 18' 6" with forks in up position. Will roll thru single doors and load into the back of a pick up. WORKING HEIGHT: FORKS DOWN-16'9" FORKS UP-18'6"
H-86" L(STOWED)-34" L-6" H-86" L(STOWED)-34" L(OPERATING)-73" W-31.5" W(STABILIZERS LOWERED)-66"
* Please call us for any questions on our material lift 18 foot manual liftsmart rentals in Portland OR, Gresham OR, Milwaukee OR, and surrounding metro area.